How one coconut ice cream recipe became a Lexington ice cream phenomenon. All they wanted was to make a little coconut ice cream. Mike and Toa Green thought it would pair well with the extraordinary Thai food they served at their Lexington restaurant, Thai Orchid Café. That was in 2011. That ingenious thought, along with the help of a two-quart Cuisinart ice cream maker, gave life to an ice cream phenomenon that attracted customers to Thai Orchid Café for orders that contained nothing more than the ice cream itself. The couple’s passion for the dessert led them to officially launch the sweet treat known as Crank & Boom Ice Cream in 2013 at Thursday Night Live. The quick success that came along with the coconut flavor at mobile events led to experimenting and creating innovative signature flavors like Bourbon & Honey, Kentucky Blackberry & Buttermilk, SuperFudge, and more. In a whirlwind of keeping up with demand, the Greens discovered an eager audience who had a hankering for their ice cream at festivals, weddings, parties and other events where they sold it, as well as among local restauranteurs who wanted to serve it at their establishments. As the mobile business kept churning, the community craved a permanent spot to savor the unforgettable flavors. 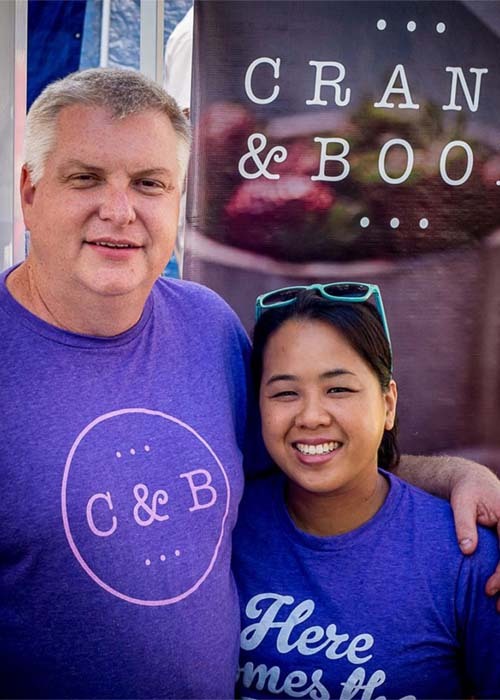 In 2015, the couple decided to expand on the concept and opened Crank & Boom Ice Cream Lounge in Lexington’s popular Pepper Campus, site of the former James Pepper Distillery. Here they serve dips, drinks, sundaes and more in an industrial chic setting. Now, the Crank & Boom family is prepared to embrace the farm chic trend, as the Greens near the opening of a second retail location in the region’s first food hall, The Barn at Fritz Farm. That’s why building their own ice cream shop is so important to them – because it brings people together. The thing that has driven the demand and growth for Crank & Boom is simple: The Greens and their team make really great ice cream. It also helps that they are totally obsessed with ice cream. Crank & Boom uses all-local, all-natural ingredients, like 100% Kentucky dairy from JD Country Milk and blackberries from neighboring farms. They combine these ingredients to create fun flavor combinations from scratch that have brought joy and happiness to fans since 2013. Additionally, all ice creams, except those that include baked goods, are egg and gluten free; they also don’t contain any artificial sweeteners or flavorings. Crank & Boom is now sold with more than 40 retail partners and served at over 100 events each summer. 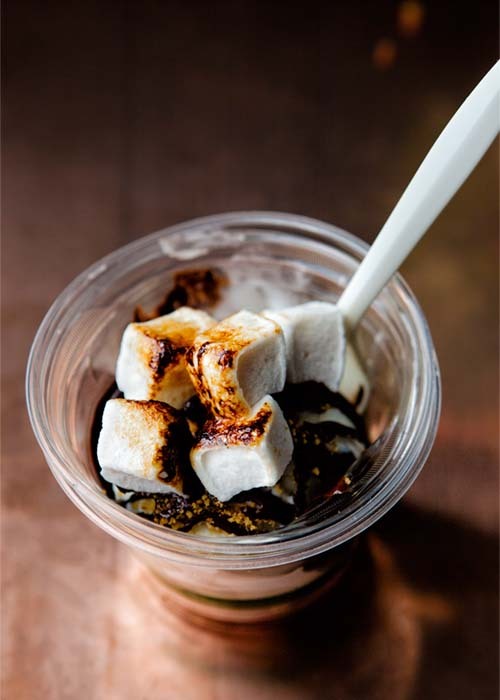 The pair’s second retail location will soon inhabit a stall within The Barn at Fritz Farm where they will continue creating melt-in-your-mouth, chef-crafted, flavor-filled combinations that will keep the Lexington community and visitors alike coming back for more. Mike and Toa believe that community is the most important part of any business. That’s why building their own ice cream community is so important to them – because it brings people together. They are committed to giving back to the people and city of Lexington which is why they are involved with more than 50 local charities in the surrounding area. They understand the importance of creating a community by establishing strong relationships with other local producers and are eager to join The Barn at Fritz Farm, a community within a community that Toa feels “has such an exciting, Lexington feel to it.” The couple is eager to join the region’s first food hall in the coming weeks and to continue inspiring other entrepreneurs to go after their own dreams. Follow Kristin Luna as she eats, drinks and art-hunts her way through Lexington.